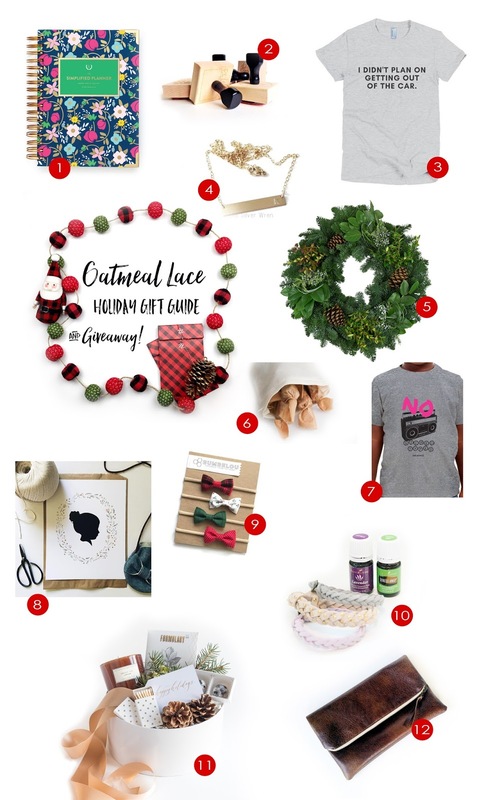 oatmeal lace design: 12 Days of Christmas Gift Guide & Giveaway! 12 Days of Christmas Gift Guide & Giveaway! YOU GUYS! I am so excited right now. What started out as a 'I want to give something away from my shop for the holidays' turned into a little something bigger when I decided to reach out to some of my favorite small businesses and see if they would like to gift something to you all as well. Right now you are looking at my first annual (yes, I am definitely going to do this again next year!) 12 Days of Christmas gift guide & giveaway! There is truly something for everyone on your list. Mom, grandma, sister, friend, teacher, mailman, neighbor, favorite nephew, etc...Did I mention I'm excited about this?! Honestly I want to win them all myself, haha! Giveaways start next Monday, 11/28 and will be running daily through 12/9. I HOPE YOU WIN!!! !